"Songmaster" by Orson Scott Card is a very beautiful story of love, friendship, and loyalty. 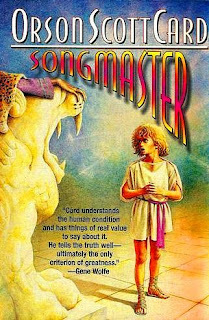 Some consider this book to be Card's best, even though it never did reach the enormous popularity of his "Ender's Game". Ansset, the protagonist of the story is a young singer who is sent to Earth to be the songbird for Mikal, who is the emperor of a hegemony of planets. What follows is pure magic, and the reader is taken to transcendental states, and places. I have read this book over fifty times, and it keeps getting better with each reading. Ansset has many admirable qualities, and everybody who meets him, desires to be his friend. Safe journeys to all the fans of Angel Watchers, wherever you may be.